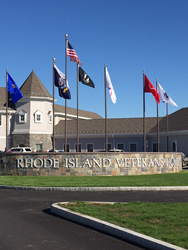 The Rhode Island Veterans Home is one of the first to incorporate a new community living concept for Veterans’ long-term care. Gilbane Building Company joined Rhode Island Governor Gina Raimondo, state and local officials, Rhode Island veterans and community members, to celebrate the completion of the state-of-the-art Rhode Island Veterans Home, and officially welcome veterans to their new home on Veterans Day. The veterans had previously lived at a home dating back to 1955 on the same 110-acre site in Bristol. The new 208-bed, 260,000 sf-plus home was designed by Brewster Thorton Group Architects of Rhode Island and SFCS of Virgina and encourages mobility, activity and socialization. Residents now live in cottages equipped with a private living space including bedroom and personal bathroom. Designed and built to retain a residential feel, the new Veterans Home contains six distinct “neighborhoods” containing two cottages that house 16 residents in each. Each neighborhood has a private family dining room and living space featuring a fireplace and comfortable atmosphere that offers families an opportunity to visit, socialize and dine with guests. The Commons building offers residents access to a bistro, arts and activities center, a beauty/barber shop, a pharmacy, medical services, a chapel, library and café dining. Additionally, physical and occupational therapy, and adaptive sports are available in the fitness/activity area. Gilbane has been headquartered in Rhode Island for more than 140 years, and has built some of the most complex and celebrated construction projects in the State, including the the InterLink at T.F. Green Airport, IGT headquarters (formerly GTECH) ,URI’s Ryan Center and the renovation of the Dunkin’ Donuts Center. For more information, visit http://www.gilbaneco.com.